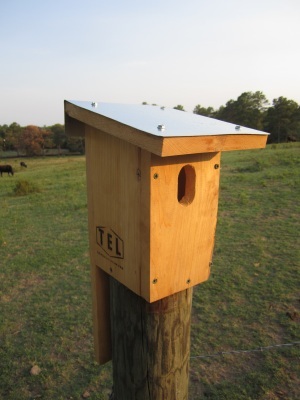 My Bluebird Nestbox is built to the recommended specs of the North American Bluebird Society, with a a vertically-oriented oval entrance hole measuring 2 1/4" tall by 1 3/8" wide. My boxes are made of either 3/4" surfaced cypress lumber; or 1" rough, unplaned cypress. The boxes are glued and screwed together for extra long life. I will add a galvanized steel roof ($5), or treat the extrerior with coat of water sealer ($5) upon request. 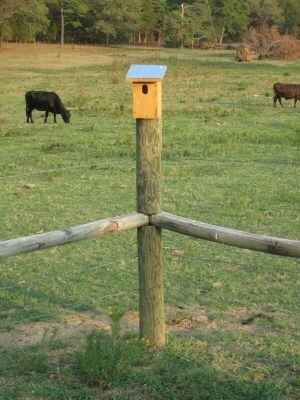 The bluebird nesting box is $25, plus shipping.